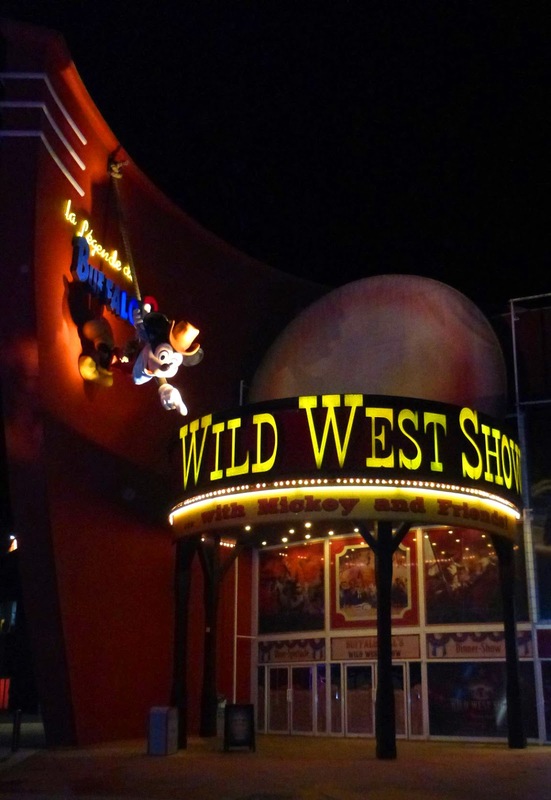 Disney Village serves as the gateway to the two Disney parks at Disneyland Paris. It’s full of shops and restaurants both Disney-specific and part of large chains. I was able to dine at two of them (both featuring Mickey!) during my visit. Here are the highlights. 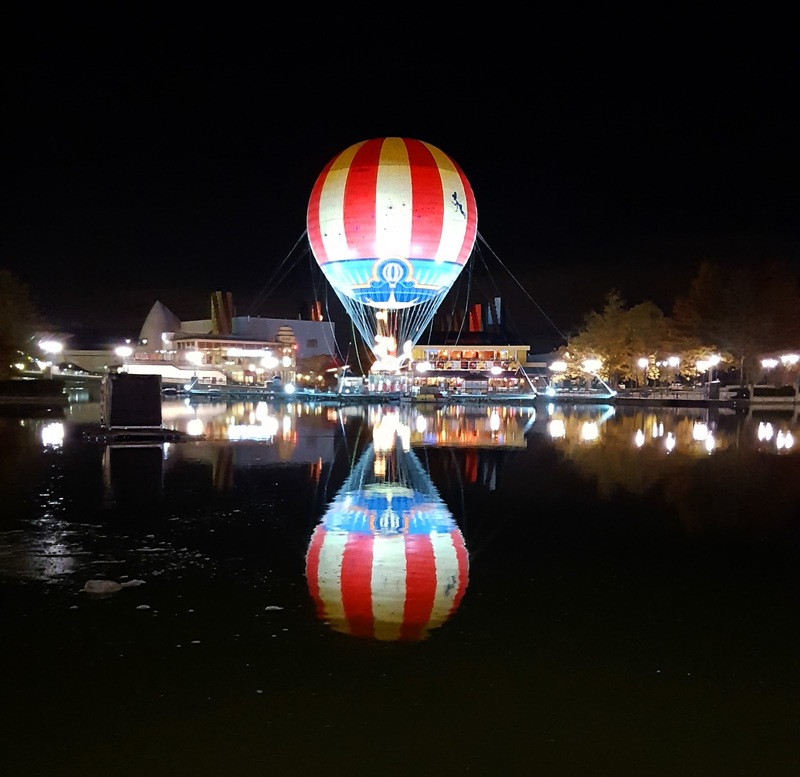 Our initial introduction to Disney Village was chaotic and involved a lot of power walking, but when we got a chance to take it in more slowly later on, I found it quite enjoyable. 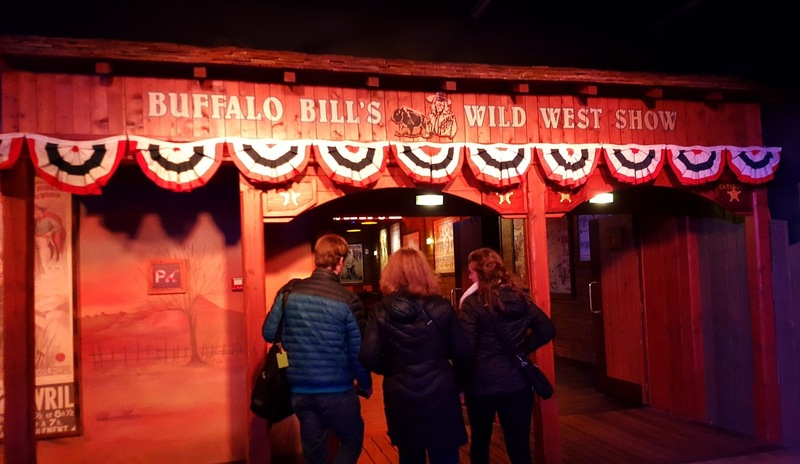 We had spent way too much time eating and touring Pointe du Hoc and were afraid that we were going to miss our 9:30 reservations for Buffalo Bill’s Wild West Show in the Disney Village, which I was hoping would present a delightfully cheesy picture of the American West. I was not disappointed. We had to run from the Sequoia Lodge (Read my review of the hotel here.) to get there on time, but we made it with seconds to spare. I’m told that we missed a fun singalong with Goofy out in the lobby area, which would’ve been fun, but I was just relieved to get to see the main show. On the way in, we were given straw hats representing our team color – getting to cheer “Go Blue!” warmed this Michigan girl’s heart – and took our seats just as the lights were dimming for the intro. I was pleasantly surprised by the food. I’d read in a bunch of places that the overall food quality at DLP is a bit lacking, so I went in with somewhat low expectations. We started off with a bowl of chili, which is a dish that I’m fairly picky about due to my dad’s most excellent family recipe, and I thought it was pretty good. It was served with a side of tortilla chips, which was a little odd, but it was tasty and hot and I loved that it was served out of a big metal bucket. The main course was delicious as well. I got a large piece of bone-in chicken, a couple of ribs, an unidentified sausage, and a pile of really good potatoes. We also got some sort of tropical juice and a choice of soft drink or beer. I wasn’t a huge fan of the sausage, but everything else was delicious. Dessert consisted of some of the best apple cobbler that I’ve ever had anywhere. It was served piping hot and I definitely burned a lot of my mouth eating it because I just couldn’t wait for it to cool down. I keep thinking that eventually I’ll learn to let my food cool before eating it, but it hasn’t happened yet. Maybe my thirties will bring me more wisdom. The show was as cheesy as expected. Minnie, Mickey, Chip, Dale, and Goofy performed a couple of song and dance numbers and there was a cowboy brawl around a campfire. Annie Oakley did a bunch of sharpshooting and the cowboys raced to deliver letters a la the Pony Express. Sitting Bull and a group of Native Americans were also featured. The end of the show pitted the audience members against each other, as the cowboys and Native Americans split up into four teams for some skill competitions. They were either totally rigged to keep the score close, or the judges were completely blind, but it was fun to cheer our blue team on. Each team also had a rodeo clown to lead it in cheers and get everyone into the competition. Ours was hilarious. The last task involved audience participation passing a ball up and down the rows and then giving it to the actors on the field to try to make a basket with it. I don’t think any of them has a future in the NBA, but we got really into cheering them on. Our team ended up winning, which was great because my family tends to be pretty competitive. The winning team gets to have three audience members chosen to help “guard” a stagecoach shipment of gold. My brother and I were both chosen, so we got to climb down onto the sand arena – I wouldn’t recommend volunteering if you’re wearing heels or other shoes you wouldn’t want to have filled with dirt or if climbing up and down a short ladder would be difficult for you – and were taken backstage to participate in the final scene. If you want to participate, looking really enthusiastic and waving your arms around seems to do the trick. We got to ride in a stagecoach with the ringmaster as it drove around in the arena. We were pretty terrible guards because we were almost immediately attacked by bandits, forced out of the stagecoach, and tied together like characters in an old cartoon. Fortunately, it’s a Disney show, so without giving away any spoilers, it had a happy ending and I lived to tell the tale. It was the perfect way to kick off our Disneyland Paris stay. This post is going to feature an unfortunate amount of pictures of me. We were delighted to find that the Disney Village stores are open late, even in the slow season, so we took advantage of that and did our souvenir shopping early. I was pleasantly surprised to find that the merchandise was fairly cheap for Disney theme park items. Even taking the exchange rate into account, things seemed like a good bargain. I bought a light-up Christmas ornament for 14 Euros, and most of the regular ornaments I’d looked at at Disney World a few months earlier were around the $25 mark. Their pins were pretty pricey though. Most of them were 7-10 Euros, which is a lot more than they retail for in the American parks. If you’re a pin fan, I’d recommend buying them from the Disney Shop Parks app or at one of the American parks if you’re able to unless there’s something specifically DLP-related that you want. Our other dining experience in the Disney Village was eating at Café Mickey on our last day. We had purchased the dining plan, and this was the only character meal it covered, so it sounded like a fun way to wrap up the Disney portion of our trip. I hadn’t looked at a menu prior to booking, and we found that there were only a few options available. I ended up with a cheeseburger, which is the kind of thing I usually avoid when traveling abroad, but nothing else really appealed to me. For dessert, I had a Mickey cupcake, which was adorable, but looked better than it tasted. We were amused by the eclectic mix of characters milling around. I’ve been to plenty of WDW character meals and they usually have some kind of theme ie. princesses, Pooh characters, Mickey and friends, etc., but this one featured Mickey Mouse, Rabbit (from Pooh), Goofy, Pluto, and the penguin from “Mary Poppins.” I was particularly excited to see Rabbit because I’d never met him before, and it’s rare for me to get to see new characters after working at Disney World for almost two years through college and grad school. I’ve spent enough time in Europe to know that meals take longer than most Americans are used to, but we were shocked at how long it took for our food. It took at least half an hour for our desserts to come, and they were all pre-made, so it’s not like there was a lot of prep work involved. When we finally got out of there, we had to run back to the hotel to get our luggage out of storage and hop on the RER train. We almost missed our Eiffel Tower tickets because we were running so late. I would leave yourself a huge cushion of time if you’re planning on dining at Cafe Mickey because you might end up missing Fastpasses or other commitments if you cut it too close. Meeting Mickey is a good excuse to be late. I really liked having the Disney Village as the gateway to the parks. It felt very much like Disneyland in Anaheim. As much as I’ll always consider Disney World to be my Disney home, the way it’s spread out is a major drawback. Park-hopping with a five-minute walk sure beats a 20-minute bus ride and going through security again. It’s also a great way to get a taste of Disney without having to shell out for park tickets. If you’re a Disney fan visiting Paris but don’t have the time, funds, or desire to spend a day or two at the parks, you could hop an RER train out to Marne-la-Vallee and spend an evening at the Disney Village enjoying the food, dinner show, or general Disney atmosphere before heading back into the city.